The Modern Motor Car - cutaway drawings by Shell-Mex from the 1930s (Maurice Beck). Homepage. This page: Publications by Shell-Mex in the 1930s, featuring lift-up cutaway drawings of cars and other vehicles. I've had three copies of "The Modern Motor Car" for some time now. Published by the Motor Oils Department of Shell-Mex and BP Ltd, of Shell-Mex House in London, this publication dates to the 1930s and is a real treat to flick through. It is a large publication, measuring approximately 10 inches wide, by 13.5 inches tall. The front and rear covers both feature a racing driver sat in his competition machine, and in small writing is the name Maurice Beck. Beck was a photographer and commercial artist at the time, so presumably the illustrations and cutaway drawings within this fine publication were penned by him, and perhaps the gent on the covers is also Beck? An accompanying letter was also distributed with The Motor Motor Car, although this is often missing from copies sold today. In the style of a certificate, it confirms that Aeroshell Lubricating Oil was the lubrication of choice for Rolls-Royce no less, while Triple Shell was officially recommended by car manufacturers Austin, Hillman, Humber, Rover, Standard-Triumph and more. Page one in the book introduces the reader to the reasoning behind publishing it in the first place, namely to describe the modern car in detail, and also explain how the key components work, and inter-react with each other. Also it was hoped that by opening the lay-reader's eyes to the inner workings of his or her car, it would heighten their interest in the subject, and ignite their interest in Shell lubricants. Readers were encouraged to put pen to paper and write to Shell-Mex House with their enquiries - no telephone numbers or telegram information is given. Cutaway diagrams of the pre-war car. Turning the page reveals a fine illustration of a six-light, four-door saloon car, described as "Section 1 - a chassis with typical side valve 6-cylinder engine and worm drive axle". 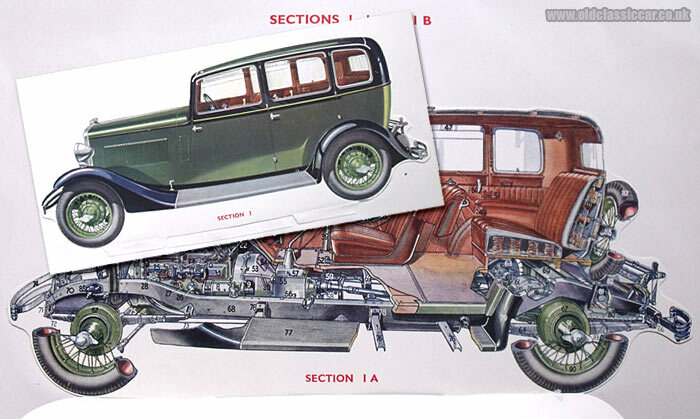 Facing the illustration is a key to all the components numbered in the drawings that will be revealed once the hinged, lift-up drawing of the saloon car is turned over. Fold the top piece of thin card back and Section 1A is revealed, a cutaway side view of the same car, illustrating the general arrangement of the under-bonnet components, the car's interior, its chassis, and the running gear bolted to it. Fold that back, and the bare chassis, with running gear, is revealed, illustrating for instance the layout of the worm-drive rear axle. Sections 2A and 2B do a similar reveal, beginning with a chassis fitted with an overhead valve engine and bevel drive rear axle. Fold that back, and diagram 2B again utilises a cutaway drawing to good effect. A note also draws attention to the fact that the car shown is fitted with a fluid flywheel transmission and "self-changing" (pre-selector) gearbox, something "only fitted to a certain limited number of makes of car" - vehicles to use such an arrangement would have included Daimler and Riley, in the 1930s, the date of this publication. There then follows a section describing a typical overhead camshaft-powered motor car, with enclosed propeller shaft. The first illustration is a cutaway view of the car's running gear, with below that, a more in-depth analysis of the visible components. Section 3C invites the reader to study the electrical arrangements to be found within a modern-day, coil-ignition, automobile. The engine itself now takes centre stage for Sections 4A and 4B. The top level illustration presents the external view of a typical overhead valve engine. The carburettor, magneto and the mechanical fuel pump are independently hinged, revealing their own internals. The outer casing of the engine can then be folded back in its entirety, to display the pistons, oil ways, valve gear and so on. Over the page is a similar explanation of a sidevalve engine's workings. The underlying reason for producing this fine booklet though was to promote Shell's range of motor oils. Page 12 is titled "Chamber of Horrors" and is a cutaway illustration of a six-cylinder sidevalve engine, displaying the many problems that a motorist might encounter with their car's engine. These include furred-up water jackets, sludged-up oilways, cracked cylinder walls, gummed-up piston rings, damaged big end bearings, water in the oil, oil leaks and sludge in the sump - some of which could of course be avoided by the use of the company's products, as "There is a grade of Shell lubricating oil for every engine". An index of components featured within the book then follows, as does a surprisingly brief chart explaining which oils were best suited to popular cars at the time (including Austin 7 Sports, MG, Morris, Rovers, Singers (including the Kaye Don and 16hp), various Talbots, Vauxhalls and others). The cars referred to seem to be upto and including 1933, suggesting that this was printed in that year. Owners of later cars are encouraged to contact their local garage, or Shell's Motor Oils Department directly. 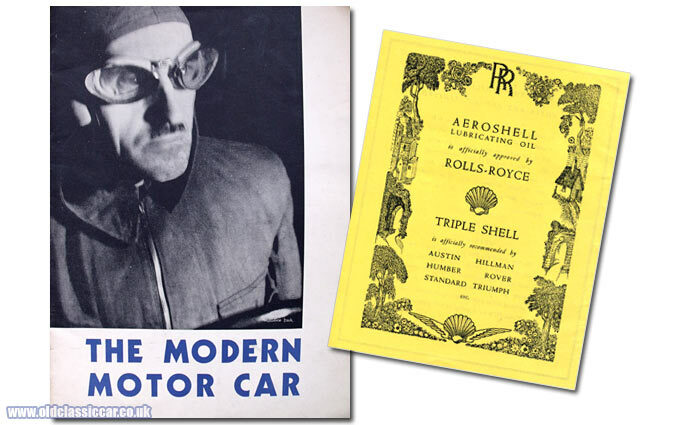 The final page introduces the reader to three Shell products - Double Shell, Triple Shell (a heavier oil), and Aeroshell (best suited to motorcycles and high-performance sportscars). Anyone with an interest in older cars would be well recommended to track down a copy of The Modern Motor Car. It's a very well turned out publication, and with its lift-up sections and cutaway drawings, is a great item to own. Copies still turn up regularly - try this page on eBay for instance, as there are usually several to choose from: The Modern Motor Car (Shell Mex - BP). In addition to The Modern Motor Car, Shell also published several companion volumes that focus on other forms of transport, in which Shell oils and fuels were - and are to this day - used. So far I've identified the following examples. 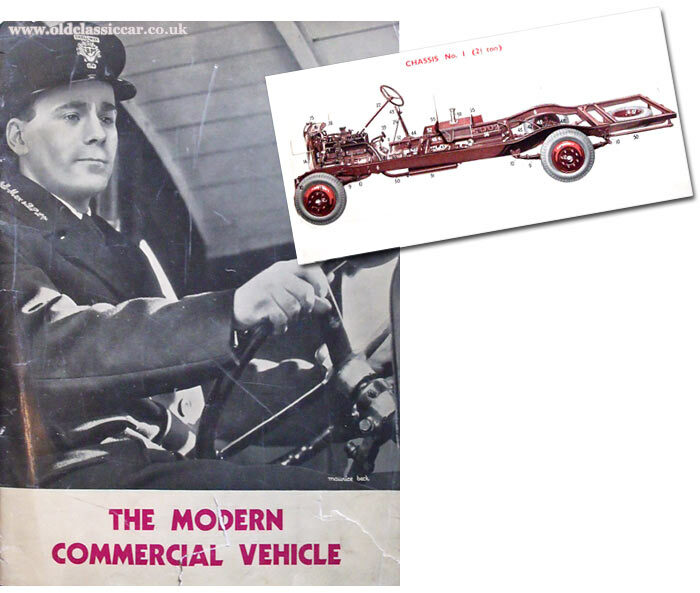 As with the car version, The Modern Commercial Vehicle also dates to the early 1930s. A Shell-Mex & B.P. driver is shown on the cover, sat in the cab of his lorry, while on the reverse there is a close-in view of a half-cab coach. The layout mirrors that for the car edition, beginning with an illustration of a 2.5 ton commercial vehicle chassis. 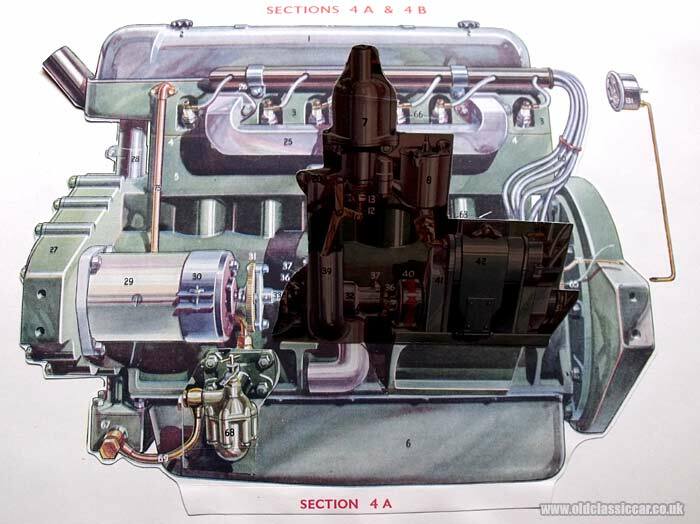 This is followed by a cutaway illustration of a typical petrol engine, with the usual lift-up flaps revealing the workings beneath. Larger, 5- and then 10-ton, chassis and engines are featured next, with both petrol and diesel engines described. Cutaway diagrams then follow which explain how mechanical parts, such as a steering box and rear axles, function. Once again, a "Chamber of Horrors" illustration pictorially describes the damage that can be done by using poor-quality, overly-aged, or inappropriate oils in one's engine. While copies of this edition do turn up for sale from time to time (I purchased this in 2015), they appear to be scarcer than the car version. I don't own either of the next two editions, so thanks to Dave Trutzenbach for photographing his copies and emailing them over. 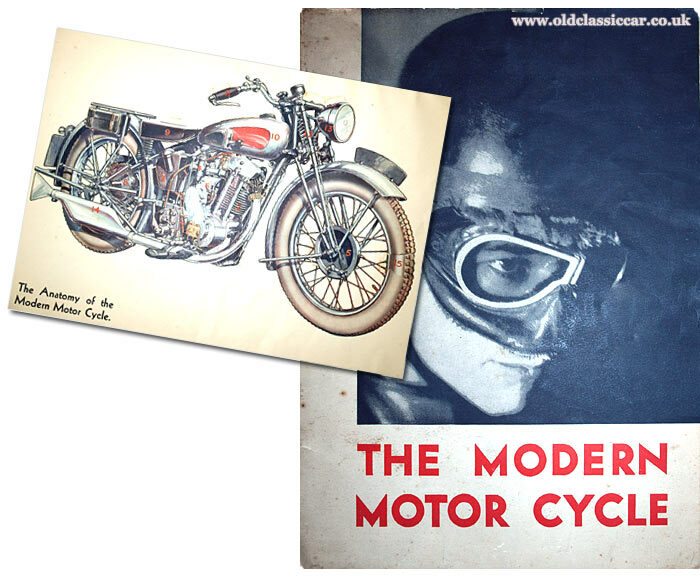 The first is a copy of The Modern Motorcycle, which follows the format of what has already been described. Again, surviving copies of this version appear to quite scarce. 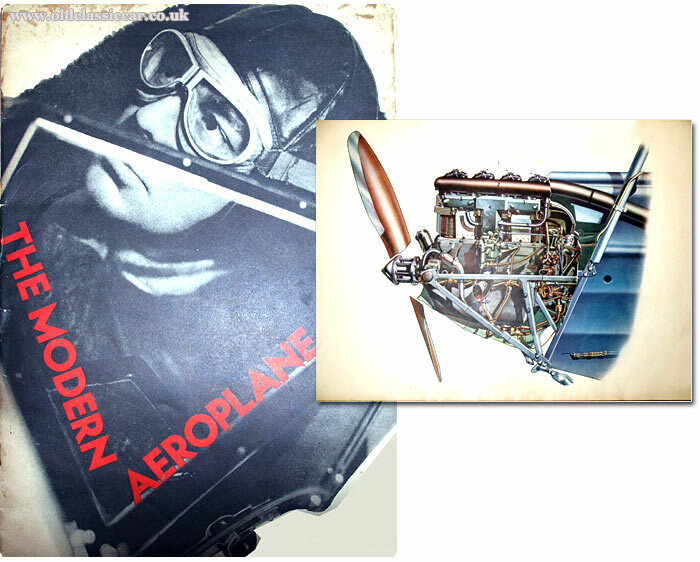 The Modern Aeroplane, along with The Modern Motorcycle, is a copy I'll probably look out for. Thanks again for sending these over. Return to the Motoring Collectables section for more items relating to early motoring. An article about collecting petrol- and oil-related memorabilia can also be found on this page.